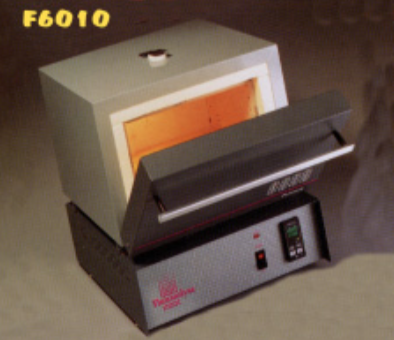 Heating elements are located on top, bottom, and sides of chamber for enhanced temperature uniformity. Venting system is located in top of Chamber to expel contaminants. Atmosphere injection is possible with pre-punched ports at rear of furnace. Optional stainless steel shelf doubles load capacity (maximum temperature of 9000C). All models are equipped with door safety switches to remove power from the heating elements upon opening the door. For safety, an open sensor will activate the sensor break protection and remove power to heating elements; eliminates run away conditions. Control A) Analog Control holds accurately at one temperature. A single digital display indicates chamber temperature or setpoint. Control B) Single setpoint, digital control reduces overshoot. Includes OTP alarm. Control C) 8 segment programmable control. Allows programming the rate of temperature increase and decrease (ramp), and the length of time the temperature holds at specific levels (dwell). Control D) 16 segment programmable control that includes a RS232 communications port for connecting to printer or computer. Stores up to four programs. Models F6010 and F6018 are supplied with cord and plug set, all others require conduit connection. -33 Modes are CE Marked.